Former Australia captain Steve Smith returned for a practice session at the nets after undergoing an elbow surgery. The 28-year-old, who is currently serving a one-year ban from international cricket for ball tampering incident, uploaded a video on his Instagram account, in which he was seen facing a few deliveries at the Sydney Cricket Ground. Captioning the video, the right-handed batsman wrote: “Great to have my first hit back. The elbow is feeling good.” The batsman had undergone the knife in January after being forced to drop out of the Bangladesh Premier League tournament due to the injury. He added: “He (Warner) is a world class player. Against him, as a bowler I always felt under pressure,” Morkel said. Both Warner and Smith will be eligible to return to international cricket after their ban ends on March 29, 2019. The duo is likely to be seen at the IPL tournament, where the former will play for Sunrisers Hyderabad, while the latter will join Rajasthan Royals side. 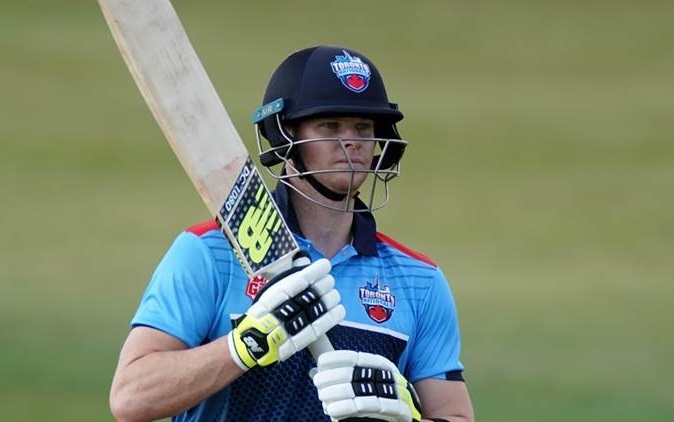 Captioning the video, the right-handed batsman wrote: “Great to have my first hit back. The elbow is feeling good.” The batsman had undergone the knife in January after being forced to drop out of the Bangladesh Premier League tournament due to the injury.